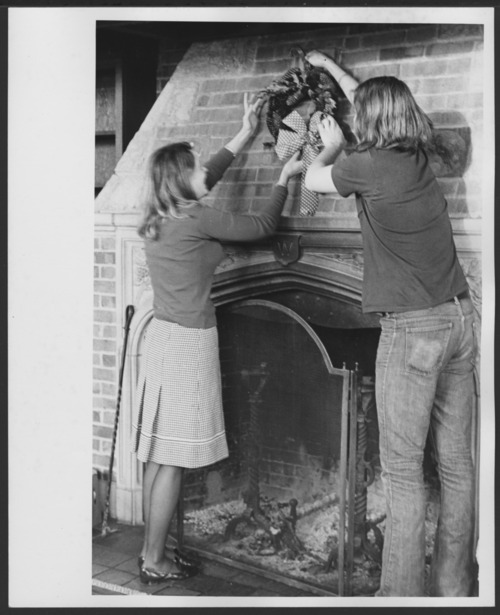 This is a view of two staff members hanging a wreath above the mantle of the Sharp House, a residence for those patients of the Menninger Clinic who were learning to live on their own. The photograph shows the fireplace in the library of the Evelyn Sharp House. Evelyn Sharp, a trustee, donated the funds needed to purchase the house for use in After-Care Services. The Menninger Clinic has since moved to Houston, Texas, but the Sharp House is still a group home and is now owned by Valeo Behavioral Healthcare.